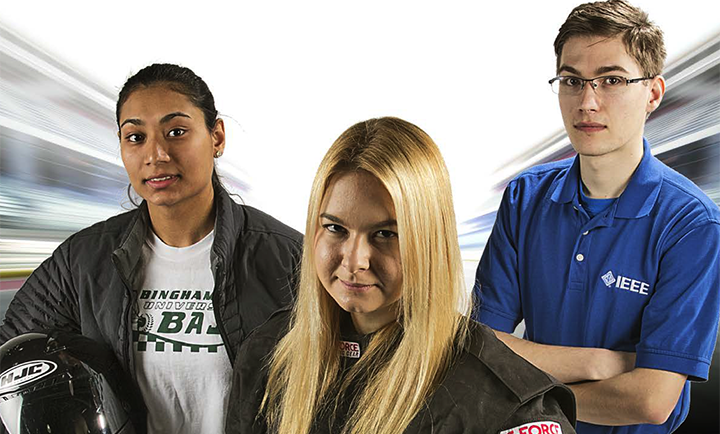 From left to right: Baja team captain Fatima Shamsuddin, Formula Hybrid team captain Anna Domagala and IEEE president Sam Stone. We’re competing against some really big schools. We might not be able to out-money them, but what we can do is out-dream them. There’s only so much you can learn from a textbook or a whiteboard. Students in the Watson School have found that to be especially true. Engineers need to take things apart and put them back together. They need to test things and constantly improve on them. That often means working with people in different disciplines to make something together. In 2017, the Watson School created a program called “Watson Competes!” that encapsulates all the different ways students have been gaining the practical skills they need with the added bonus of fun competitions, friendships and even a few awards. One example of this cross-disciplinary, hands-on experience is the Binghamton Hyperloop team which is now in its third year. A Hyperloop is a mode of transportation where a pod travels in a tube similar to the pneumatic tubes at a bank drive-through. 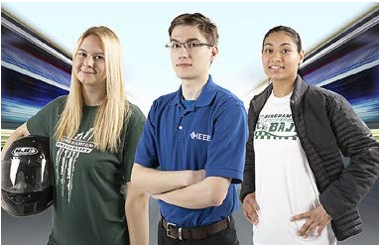 Left to right: Formula Hybrid team captain Anna Domagala, IEEE president Sam Stone and Baja team captain Fatima Shamsuddin. The team has been working on a levitation system that they think will help them get closer to the grand prize this summer. Senior electrical engineering major Anthony Dorsa worked on the electrical system in last year’s Hyperloop pod and is in charge of this year’s levitation system. If people really do colonize Mars, they might just need a robotic friend to help explore and set up outposts. The team is building a rover that can survive harsh conditions on Mars and also drive itself to compass points without any support, pour out a bucket of water and keep in contact with the home base. A rendering of the proposed Binghamton University Mars Rover. 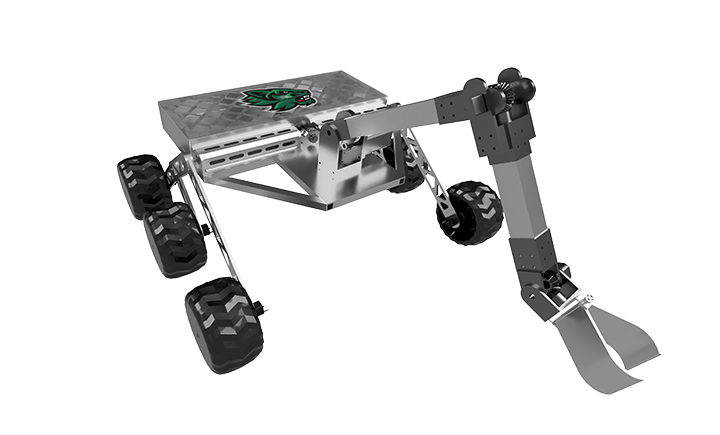 The rover will go up against the designs of other schools as part of the Mars Society’s annual competition. The team, made up of more than 60 students from all of the Watson School departments as well as geology and biology, is managed by the Binghamton University student chapter of the Institute of Electrical and Electronics Engineers (IEEE). Sam Stone, president of the chapter, says that a variety of sub-teams gives students plenty of options to match their interests. 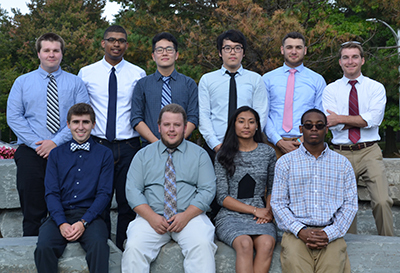 While the Binghamton Hyperloop team and the Binghamton University Mars Rover Team are relatively new, the Society of Automotive Engineers (SAE) has been a staple for Watson School students. THE 2017–18 BAJA CAR TEAM. Front row (left to right): Roland Wimmer, Adam Jeavons, Fatima Shamsuddin, Maliq Cham. Back: Alex Savage, Daniel Bello, Andrew Kim, Gukhwan (Dan) Hyun, Nick Hytell, Christopher Harragan. The Binghamton SAE is the organizing body that coordinates a variety of competitions including the Formula Hybrid, Baja and Supermileage cars. Honsinger, a junior, says that most of the cars are senior capstone projects. He wants to increase the role that younger students play in the organization with the idea that a younger group of SAE members will translate to a more competitive program in the future. Learning on a smaller project can help prepare students to work on something like the Formula Hybrid. Anna Domagala is a senior engineering major and the team captain for this year’s Formula Hybrid — the newest car in the SAE lineup. Unlike some other teams, the Formula Hybrid team has quite a few graduate students assisting with production this year. Rob Dean ’17 worked on the Formula Hybrid when he was a senior, and now that he’s a master’s student, he’s continuing to assist with the production. The Baja car team is facing exactly that problem. Fatima Shamsuddin, Baja team captain and a senior mechanical engineering student, says this year’s team is mostly new to SAE. “We’re a really diverse team, which is amazing because it’s not often what you picture for a Baja team, but we’re mostly all new. We know a lot of the theoretical stuff, but we’ve been asking around to find out more about terminology or to get feedback,” she says. of those who came before and those who come from different disciplines. A theme across all the competitions is the constant drive to imagine something better than what has come before.